Cut down on the stress of preparing meals for supper by making and freezing food. Freezing tips: Prepare a large pot of a simple curried mince or Bolognese recipe and double or triple it. Let the rest cool, divide it into portions and freeze it. Cooked mince can be frozen for two to three months. 1 Bobotie – Spoon the mince mixture into an oven dish, make a simple egg custard and pour it over the mince, add a few bay leaves and bake until heated through and set. 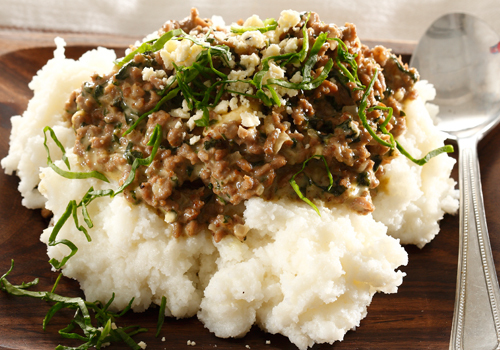 2 Vetkoek with curried mince – heat the mince in a saucepan, add a cup of peas, heat and fill the Vetkoek with the mixture. 3 Curried shepherd’s pie – Mix a few grated carrots with the mince, spoon into an oven dish, cover with mashed potato or mashed vegetables (a mixture of mashed potatoes and pumpkin or carrots) and bake in the oven until heated through. 1 Lasagna – make a simple white sauce; arrange layers of lasagna sheets, mince and white sauce in an oven dish, ending with white sauce and cheese. Bake in the oven until done. 2 Bolognese-pizza – spread the mince over a prepared pizza base, arrange a few halved cherry tomatoes on the mince, sprinkle with cheese and bake in the oven until done. Sprinkle with fresh basil and slice. 3 Tomato soup – heat the mince, a can of chopped tomatoes and 1 litre of beef extract in a pot, season with sugar, salt and freshly ground pepper and bring to the boil. Serve with toast.